H-Lab is a program that has been held in August of 2011(1) and 2012, which I and Impact Japan, with others, have supported from the start. 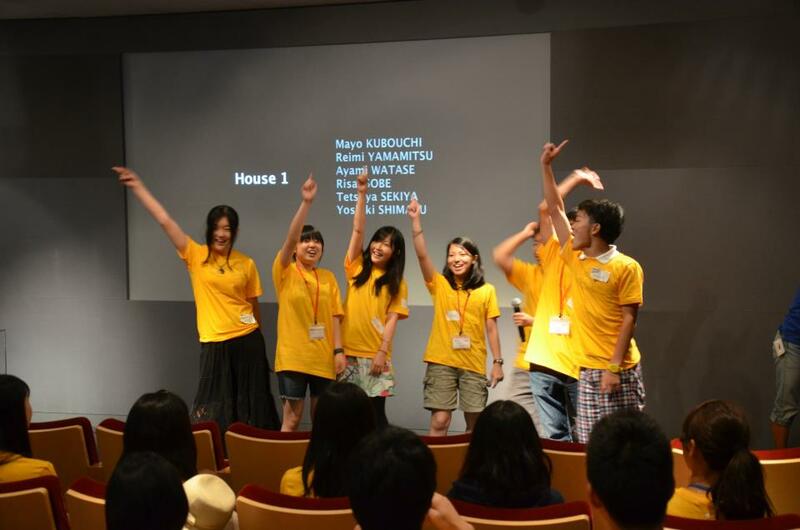 It is a one week long summer program for high school students that is made up of mostly undergraduate students from Harvard University as well as Japanese universities. It aims to teach high school students the importance of liberal arts, as well as the fact that liberal arts is the foundation of the university education in the United States and Great Britain. The second and third year high school students who participated in the program in 2011 and the third year high school students who participated in 2012 have begun to be accepted by universities from this spring and they are almost decided about which universities they will attend. Eleven out of twenty-two male students will go to a university abroad. Twelve out of thirty-two female students will go to a university abroad. Among overseas universities, there are nineteen students who are going to universities in the U.S., two in the U.K., one in Canada, and one in Australia. There are some students who were accepted to the universities that are on everybody’s minds, such as Harvard, Yale and Imperial. Some had a difficult time choosing because they were accepted by more than few universities. Some students were also accepted to University of Tokyo and there are three students who chose to study abroad instead (although they may be enrolled in University of Tokyo). By allowing students to go through real experiences rather than just thinking in their heads, and offering ‘peer mentoring’ by university students who are a bit older, the impact that this program has on students is giving them the opportunity to find their own motivation and choices. Such students who choose to challenge themselves by studying abroad are likely to keep broadening their horizons. It is something to look forward to. After participated Manaba, I departed Haneda Airport on July 6th for Nadi in Fiji, via Hong Kong, and then to the capital city of Suva. I attended the Inter-Congress (1) of the Pacific Science Association. Everywhere you go, you first say “Bula,” the greeting for hello. This association was established in 1920 and I have been quite involved in its work since 2003. On this website, I have written about the activities in Okinawa, Tahiti (1, 2, 3) (including the hidden story of Yoshida Shoin), and in Kuala Lumpur after the Great East Japan Earthquake and Tsunami in 2011. This time the congress was held at the University of the South Pacific and there were many students who were active as volunteers and it was a vibrant environment. I met with some Japanese professors who are members of the faculty here as well. The next day, President Ratu Epeli Nailatikau gave a powerful speech at the opening ceremony. At the opening ceremony, myself, Professor Nordin Hasan, Director of Asia Pacific Regional Office of ICSU gave the keynote speeches. Ambassador Eichi Oshima also attended the ceremony. We were interviewed by television reporters and were on the evening news. The next day, it was widely reported in the newspapers as well. Over the next two days, there were many activities organized around the sessions. I spent three hours sightseeing, had dinner with USP Vice-Chancellor and President Chandra, and was invited by Ambassador Oshima to lunch, where I spoke with members of the Embassy and Japanese people who work in Fiji. I also met with female UNDP officials who are working in Pakistan, Sudan and Fiji. The official residence of the Japanese Ambassador to Fiji was acquired twenty years ago, is in a prime location in Suva, the capital city of Fiji, and has an incredible view. Fiji was a British colony in the past and recently has been developing relations with India, China and South Korea. There are many Chinese fishing vessels that have come to do tuna hunting. Although the work of Japan is well known, there seems to be few Japanese people here. This is also one of the challenges facing the Ambassador. Manaba is an initiative started by a company to provide a new platform to help support education, and is being used by more and more universities worldwide. It is indeed a very ambitious project. On the 5th of July, a seminar mainly aimed at professors, teachers and staff at educational institutions, was held in Tokyo. It was attended by a many people. The bulk of the presentations (link in Japanese) were case-studies of the initiatives taken by universities that are using Manaba, but I was asked to give keynote address, a one-hour long speech encapsulating the main theme, ‘Global Trends: Understanding What Drives Them’. This is exactly what I want to do, to convey the efforts of the many educational institutions in the field who are constantly need to adapt and widen the possibilities for students and to make them think about the career that they pursue within the greater scheme of things. And I believe that the audience was composed of people involved in universities, in fields like education and administration offices: and all the questions raised during the Q&A centered around this central topic. My keynote speech was titled ‘Uncertain Times: The Choices You Make’. Needless to say, my slides were built around visuals, with minimal explanations in English with large fonts. My speech centered around my message which exhorts each person to get an overall feeling for globalization and to fulfill the responsibilities required of each of their professions and administrators. My hour was over in no time, but I was confident that my message had got across, judging by the responses of the audience during the last panel discussion and the reception afterwards. In the last panel discussion, I was with Dr. Iiyoshi (1), who repeated that education looked to instill a bit of insanity, while I also stressed that it was the ‘crazy ones’ (1) who change the world. We also had Mr. Sato, an unconventional member of MEXT , along with Mr. Fukuoka from METI. Dr. Iiyoshi threw his ‘punches’ of ‘madness’, while the two government officials were willing to step out of the boundaries of the ‘ordinary’, a characteristic of young bureaucrats. The audience also voiced their　opinions about their anxieties and concerns related to their work in education, showing their dedication and sincerity. I truly empathize with them. Thinking out of the box, changing perceptions, being the nails that stand out, whatever you call it, the important thing is to go beyond boundaries. The future of Japan in an increasingly globalized world lies with the future generation. I wonder how many people in positions of higher responsibility understand this situation and act accordingly, dealing with this dilemma as a matter of ultimate importance. I wonder how many people strive to harness their full potential and do their best to fulfill the calling of their duties. This includes the need to instinctively understand global trends, through proper information, and to put these trends into practice to help the nation.In a society such as Japan’s, where there exist terms such as ‘academic elite’ and ‘University Tokyo talk’ , this may be too much to ask for. Even if this problem is recognized, too many are lulled into inaction by the sheer number of reasons why they think change cannot be brought about. This is the situation that we have here in Japan. It is of utmost importance to not only think but also to act at the same time, hard though it may seem. The United Nations University is located in Aoyama in Tokyo. A graduate program has been established here in collaboration with a group of research institutes across the globe, the Institute of Advanced Studies in Yokohama, and with links to other universities. The graduate school commencement was held on July 3. Since being involved in the Science Council of Japan, I have been active in advocating strengthening the connections between the scientific community in Japan and the United Nations University. I have worked with the past two Rectors of the university, as well as the new Rector, David Malone, with whom I have a mutual friend in Canada and have been in contact with before he assumed office. In these past ten years, there have been many conferences held at the university and I have enjoyed many opportunities to speak here. The graduate school at the United Nations University was established in September of 2010. As it is a new graduate school, it is still quite small. This year, twelve people from twelve different countries graduated, representing the maximum diversity (there were also a few other students who graduated in the spring). I was very happy to have the privilege of being invited to give the Commencement Speech. My speech can be accessed from the link here. It was a wonderful graduation ceremony and everyone seemed happy. The ceremony began by a video message from President Malone, who had an urgent matter abroad, followed by a speech by the Senior Vice-Rector, Kazuhiko Takeuchi, my speech, the awarding of the degrees, speeches by three of the graduating students, and finished with the reception. Is an indescribable and moving feeling to send off into the world young peoplewho will make a new start. I returned to Japan from Washington D.C. on Saturday the 21st. I took the day off on Sunday, was busy with meetings on Monday, and departed once again for the U.S. east coast on the morning of Tuesday the 25th for Boston. I took a direct flight from Narita, on the Boeing 787 that made the news with its problems of fire on its Japan-made battery last year. I arrived around noon on the 25th. After resting briefly, I went to the MIT Media Lab. This was not the main objective of my trip, but I paid a visit to the Media Lab Director, Joi Ito (1) and the Associate Director, Dr. Ishii (1, twitter: @ishii_mit) and they showed me various projects. Ryuichi Sakamoto also happened to be there and they are talking about possible collaboration. They are involved in many interesting things. In the evening, I had a pleasant dinner with Dr. Ishii, his wife, who is a journalist and was a Niemann fellow last year (I follow their twitter), and his secretary. The next day, I met with Professor Richard Lester, who invited me to Boston. He is the Director of the MIT Nuclear Science and Engineering. He is leading a program entitled the International Nuclear Leadership Education Program, which is being held twice this year, each for two weeks, and invited me to the course. I was there for just one day, but I participated from eight in the morning through the afternoon. Among the participants were nuclear experts from the U.S. and Europe, many of them know Japan nuclear leaders and the IAEA, and qualified people from Vietnam, Abu Dhabi, Kenya, Mongolia, and Nigeria. They will go on to make their careers in this field, so the discussion was very lively and interesting. The English version of the well-known NAIIC (National Diet of Japan Fukushima Nuclear Accident Independent Investigation Commission) Executive Summary report appeared on-line at the time of NAIIC report in Japanese and the full report was also made available on-line last October. As the full report is available, experts and everyone around the world can study and evaluate our report. In the evening I attended the reception at the Museum of Science of Boston <http://www.mos.org/>. The next morning, I started my return journey.